A millennia of almost constant war on the European continent left its land and people scarred. Voices called for an end to the violence and for the creation of a “United States of Europe” – has the long dreamed about idea now become a reality? European philosophers and statesmen have often theorized about the creation of a united Europe. In fact, Napoleon’s conquests represent one effort at creating this unified entity, only through war and not through diplomacy. Victor Hugo also advocated for a political union of European nations that would unite its citizens in brotherhood. Unfortunately, with WWI and WWII looming on the horizon, Europe’s wars once again caused havoc- not only in Europe but around the globe. The first step on the path to contemporary European unity began on May 9, 1950 with French Foreign Minister, Robert Schuman’s presentation of a plan for deeper economic and political cooperation between European countries. The treaty establishing the European Coal and Steel Community (primary document) was signed by Belgium, France, Italy, Luxembourg, the Netherlands and West Germany in 1951 and ratified in 1952. Its purpose was to combine the continent’s national heavy industries to economically tie the countries together and make war over natural resources and land politically unviable: If the industries of traditional enemies were intertwined and economically co-dependent, it would be financially and logistically difficult for them to wage war again each other. The Treaty of Rome, signed by ECSC members in 1957 and ratified in 1958, created the European Economic Community (EEC) and established a customs union, which abolished trade tariffs on goods moving between member countries and established a common tariff on goods coming from outside the member area. In 1962, the members established a common agricultural policy and in 1967, these and other earlier treaties and their governing institutions were combined to form the European Community (EC). Ireland, the United Kingdom and Denmark formally applied to join the EC in 1961 and were accepted in 1973 in the first Enlargement (though not without contention from French President Charles de Gaulle). The Norwegian government had also applied to join, but its citizens voted to reject membership. In 1979, EU citizens directly voted to elect members to the European Parliament (EP) for the first time; previously, EP members had been elected through national parliaments. 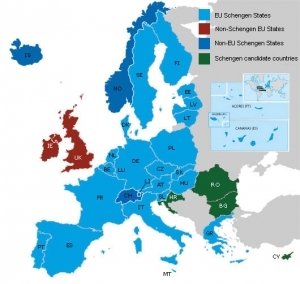 Some countries that are part of the EU are not part of the Schengen area; other countries are part of the Schengen area but are not in the EU. Why? In 1985, the founding members, excluding Italy, signed the Schengen Agreement, which effectively eliminated borders for goods, services, transportation and people traveling within those countries. By 1986, the European Community had expanded further to include Greece (joined in 1981), Spain and Portugal. Despite the customs union, trade was not flowing as freely as planned between member countries. This was largely due non-tariff barriers like differences in national regulations. To remedy this problem, members signed the Single European Act in 1986 to speed up integration and make the common market more efficient. This treaty also expanded the power of the EC in environmental protection and coordinating foreign policy. The collapse of the Soviet Union and its repercussions were felt across the continent. After the fall of the Berlin Wall in 1989, the two Germanys were reunified and East Germany was incorporated into the EC in 1990. The Treaty on the European Union, commonly known as the Maastricht Treaty, was signed in 1992, and set clear rules for the implementation of a single currency, as well as deeper cooperation on foreign and security policy (CFSP) and justice and home affairs. The organization’s name was formally changed to the European Union (EU). As part of the move towards the single currency, the single market was established in 1993, and clearly and officially put into place four freedoms: free movement of goods, services, people and money. Membership expanded to 15 when Sweden, Finland and Austria joined in 1995. The Schengen area was also expanded to include Spain and Portugal. In 1997, members signed the Treaty of Amsterdam (summary here), which came into force in 1999 once all member countries’ parliaments had ratified it. Its main purpose was to reform the EU institutions to be able to better handle future enlargements, and to create a more transparent governing system (source). The euro was introduced in 1999 in 11 countries for commercial and financial transactions. Greece adopted the currency in 2001, and paper money and coins were introduced in 2002. Today, there are 18 members of the euro area. This is the EU in 2014. Throughout the 1990s, the EU was directly confronted with the crisis in the Balkans. Several EU members were active in the NATO-led intervention in the Bosnia in 1999. In 2003, collective forces from EU member states took over NATO peacekeeping missions in Macedonia, and Bosnia and Herzegovina, as part of the EU’s CFSP. Now a decade later, the EU has the chance to play a decisive role in the area through Enlargement with the applications for candidacy from Serbia, Macedonia and Montenegro; Croatia has already been accepted. The EU is overseeing the Stabilization and Association Process in Bosnia and Herzegovina, Albania and Kosovo, who can then apply for candidacy when they are ready. EU leaders then began membership negotiations with 10 central and Eastern European countries. Many of these countries felt culturally tied to Europe through shared cultural traits, values, and linguistic origins; after years of communist dictatorship, there was a strong internal push from the part of Central and Eastern European countries to join the European Union and share in its four freedoms. 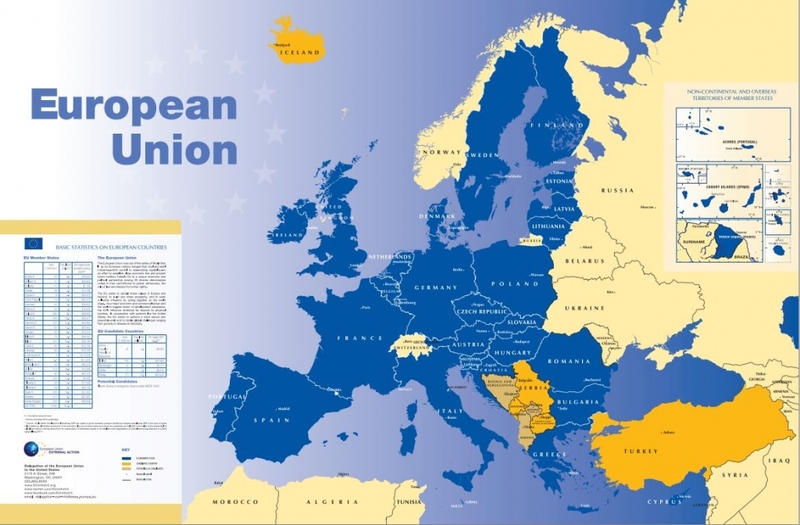 The 2004 enlargement of the European Union was the largest it had ever had, taking the European Union from 15 to 25 member states overnight. After the Treaty of Nice (signed in 2000 and ratified in 2003) paved the way for expansion, the Czech Republic, Estonia, Latvia, Lithuania, Poland, Slovenia, Slovakia, Hungary, Cyprus and Malta joined the EU in 2004. Bulgaria, Romania and Turkey became official candidate countries. Bulgaria and Romania joined in 2007; Croatia applied for membership in 2007 and joined in 2013, bringing total membership to 28. Today, Turkey remains a candidate country, along with the Former Yugoslav Republic of Macedonia (Macedonia), Serbia, Montenegro and Iceland.